When first talking with Lindsey about her thoughts for the kitchen she was certain about a lot of things. She had already been thinking a lot about her dream kitchen, something I really admired. She was 100% clear that she wanted shaker style cabinets, slate floors, white quartz counters and white subway tile with dark grey grout. 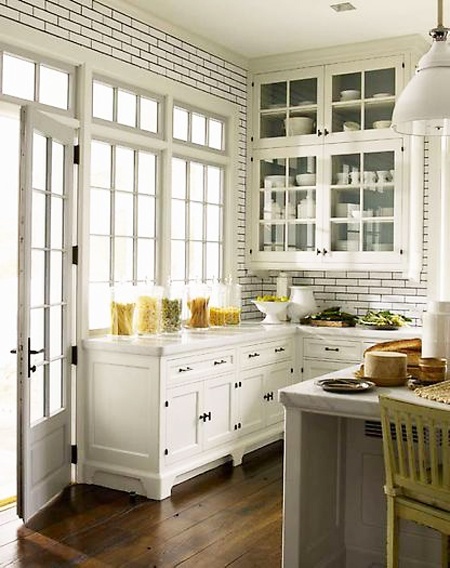 We both agreed that since the house was older but they have more modern/contemporary taste that having the essence of the kitchen be simple but more in the traditional vein made a lot of sense. We would add modern elements in other parts of the design. And the overall look we are going for isn’t too traditional, I’d say more classic. Lindsey was really in love with the white tile/grey grout, but to be totally honest, when she first said it I had to put on my poker face. 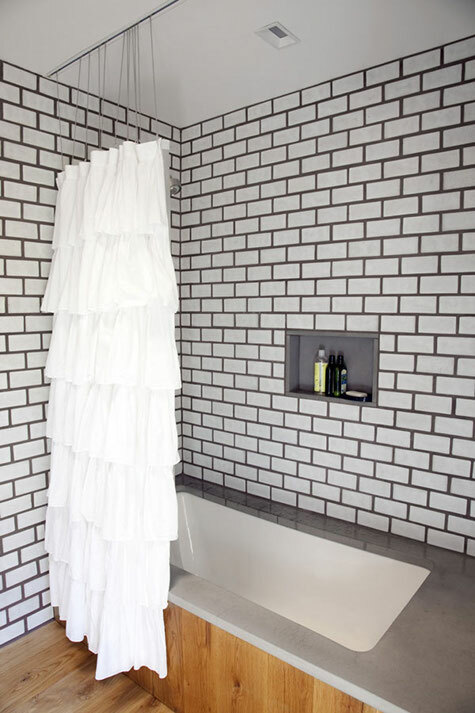 The next day I was talking to a friend and I confessed that I was a little skeptical about this combo for some reason… somehow my brain was only showing me these pictures of big fat really dark grey grout lines with white tile. Needless to say whatever was going on in my head wasn’t pretty – shame on you Nancy’s imagination – going straight for the ugly. I found this image online and am pretty sure I was imagining something like this which, if you like it is fine by me, but I realized that more than anything I just hate really large grout lines, it reminds me of children just learning to color inside the lines or something…. cute when kids do it with crayons and color. Not so cute all over your wall, blech. So my friend sent me a few links to some images of this aesthetic as we were talking about it and I was immediately SO glad I hadn’t said anything about my initial reservations, I really like it! 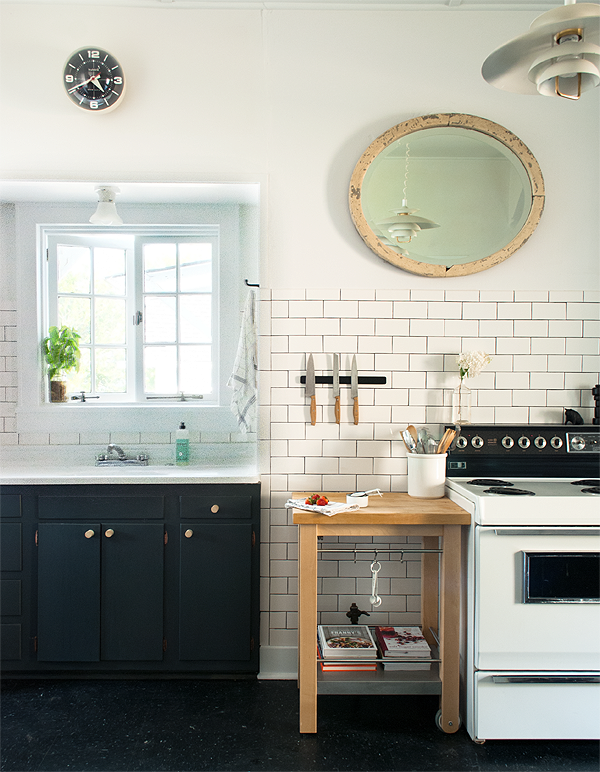 And the irony is that it’s a real vintage feel and I am always falling totally in love with older spaces with exactly this look (whether or not the grout was grey or not when it was new)! So, phew – the walls will look great, the space will be completely transformed and the overall style with compliment both the bones of the house and Lindsey and Doug’s style. 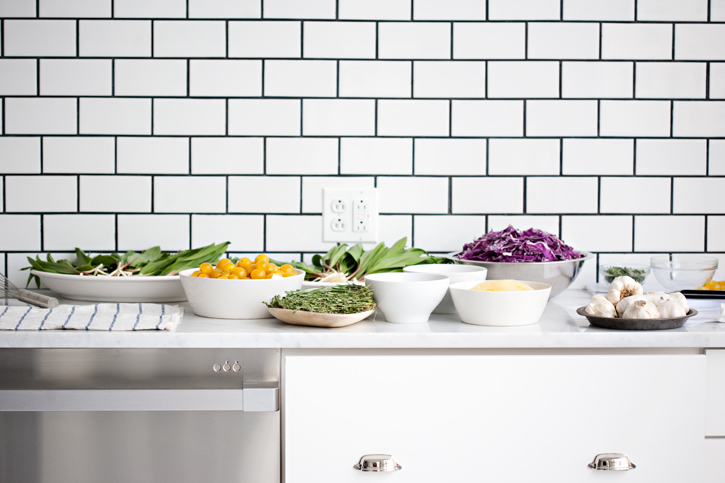 this is a great image from Sunday Suppers – note the smaller grout lines… looking better already. the tile in this image from Manhatten Nest is one of my favorites for sure. we are also using an apron sink but in stainless steel… and the faucet we chose is similar to this image. I tend to prefer grout that isn’t such a severe contrast so our design is a bit more subtle than these photos. And I can’t wait to show you the final palette… no matter how certain you are – the minute you start looking at the actual materials – all together – things inevitably start to change. Stay tuned!